Living in Washington DC, only four hours drive from New York City, I have been lucky enough to be able to visit this incredible city many times in the last ten years. It is always crowded, busy and messy but still magical. It hosts people from all around the world and serves food from all continents. I read somewhere that, in the New York City, even if someone eats two meals a day in a different restaurant everyday, they wouldn't be able to taste all the restaurants in their lifetime. That says so much about the magnitude of this world's largest city which has so much to offer to everyone. You can possible buy everything that money can buy here. After all, this is the Financial Capital of the free world. This majestic city is the home for almost 10 Million New Yorkers and travel destination for almost 60 Million tourists every year. No matter what day of the month or what month of the year it is, the crowd doesn't seem to be lessening. People are out and about even if it's blazing hot outside or freezing cold. This city of concrete jungle welcomes you with the magnificent view of countless skyscrapers which seem to be growing in numbers every day. One does not have to be an architect or a photographer to admire the skyline of New York City. When I visited this city for the first time in 2009, I drove through New Jersey Turnpike and reached to the city via Lincoln Tunnel. When I saw the glimpse of these skyscrapers for the first time (from a distance), I was in complete awe and forgot to take a photo. I went there for the July 4th weekend to celebrate America's independence day and witnessed one of the biggest fireworks in the world. Even though I had just started learning about photography, I took my camera with me but didn’t feel ready to go out and shoot. I returned with some casual shots of friends and family gathering and promised myself to come back more prepared. I visited the city many times ever since and had managed to take few shots here and there. However, I was not satisfied with the outcomes and felt something was still missing. I decided to visit the city again and this time, I went back fully prepared to capture NYC in its full glory. This time, I was determined to get the shots I have always wanted and from as many places as I could pinpoint. Couple weeks ago, I shot the Baltimore Inner Harbor during blue hour and I was very happy with the result. If you have enjoyed doing landscape photography, you might also have realized that how fast natural light changes from the sunset to the blue hour to the darker hour. If you are not well prepared for the shot, it's very easy to miss the window for the proper light. Usually, when I plan to shoot for the blue hour, I complete the camera setup just before the sunset and then monitor the light very closely. Then after the sunset, I take few shots in 10-20 minutes interval until I get the result I am happy with. Last week after passing the blue hour, I stayed little bit longer and then captured the darker hour Inner Harbor as well. I think I took this photograph around 9:00 - 9:30 PM on the same day I shot the Harbor in a blue hour. You can see how much difference the changing light from the blue hour to the darker hour makes on the photograph. Even though these two photographs are not taken from the same spot, you can see the similar buildings on both photographs and the composition is also somewhat similar. This shot was also taken in an Aperture Priority (A) mode with an aperture value of f/8 at 16mm focal length using ISO 200. The camera adjusted the shutter speed for me automatically. Even though I love taking all kinds of photographs, landscapes and cityscapes are my favorites. This photograph was taken using Nikon D700 and the Nikkor 16-35mm f/4 lens without using any filter attached to it. I welcome any comments or critics you may have. Happy shooting! One of the best things Washington DC Metro area residents could do is go out at night and shoot around the National Mall area. I have probably done it more than ten times in seven years but it gets better and more exciting every time. It will be difficult to go out and shoot during the winter season but it gets better starting April-May and until October. Since it is the capital of the free world, you can never count on the day traffic even on normal working days and, it will be almost impossible to park anywhere or get there on time if it is a special events day like Cherry Blossoms festival or Memorial Day weekend etc. If the weather is nice, you will see many local residents and tourists visiting around the national mall area and spend beautiful evening with their friends and family. The national mall, monuments and the museums are probably one of the most popular destinations for the tourists and the photographers from all around the world. I have met many professional and amateur photographers who come to DC to capture historic landmarks and also learned a lot from them during those random meet-ups. If you are planning to shoot there at night, you might want to carry a tripod with you. To avoid any blurriness in low light condition and specially if you are trying to shoot with more than couple of seconds of exposure, tripod is a must have tool. It is also a good idea to carry shutter release cable or wireless shutter release device to avoid any camera shake while using camera on tripod. It will be no problem using tripod around the National Mall but you will have to be careful using it inside Memorial buildings. I was trying to use it inside Lincoln memorial to get a closer shot of Lincoln but guarding officer didn't allow me to use it. I saw people using the monopod but the tripod was not allowed for some reason. Along with these photographs, I have included the brief location, name of the memorial and the camera settings for the individual shot. If you have any questions or comments about these images, please mention them in the comment section and I will try my best to answer them. This shot is taken from the World War II memorial looking towards the Washington monument. I think it was undergoing some inspection or damage repair caused by the earthquake in 2011. You can see the scaffolding on the side of the monument. The monument came little overexposed than I would prefer but since there was nothing of interest in detail, I left as it is. This one is the World War II memorial which is dedicated to those Americans who served in the armed forces and as civilians during the World War II. It was past midnight and the fountains were already turned off. You will see the fountains with the lights in my other shot below. 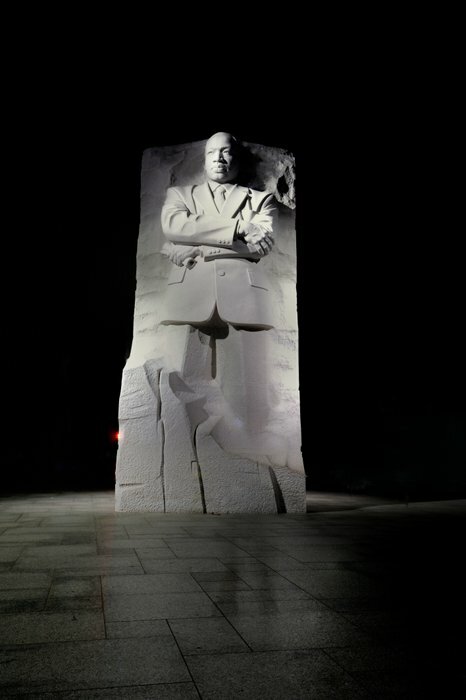 The Martin Luther King Jr. memorial is the latest addition to the historic landmarks around the National mall. I think I was there at around 2 am in the morning and I noticed a group of international college students and their professor were visiting the memorial while their guide was explaining them about the monument and the Dr. King's role in the civil rights movement. This is the picture of the World War II memorial while the fountain lights were still on. In this shot, I tried symmetry composition. This shot is taken from the stairs of the Lincoln Memorial looking towards the Washington monument. You can also see the World War II memorial in between and the Capital Hill behind the Washington monument. I hope you like these photographs and also hope that it will encourage you to get out from your comfort zone and do some experiments with your camera. I always wanted to capture beautiful cityscapes, specially night cityscapes, because of the spectacular view of buildings with different lights and colors. 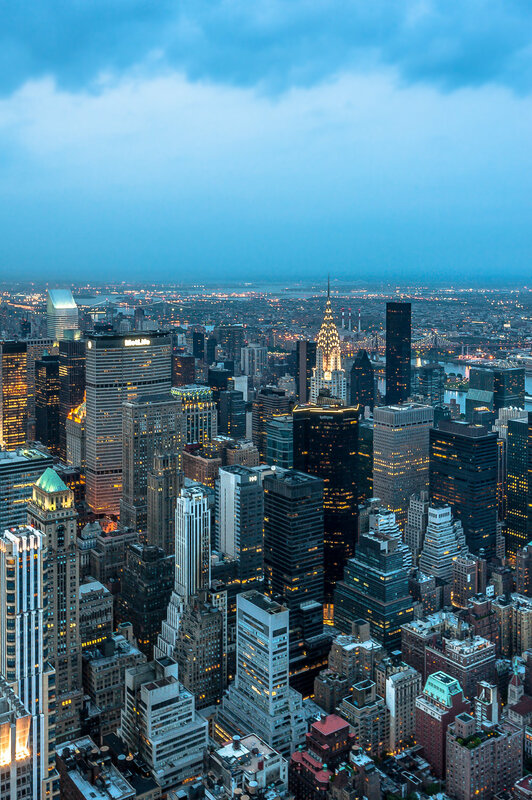 This summer, when I was traveling to Cape code, MA, via New York, I quickly stopped by NYC and got a glimpse of Manhattan Midtown in the evening. 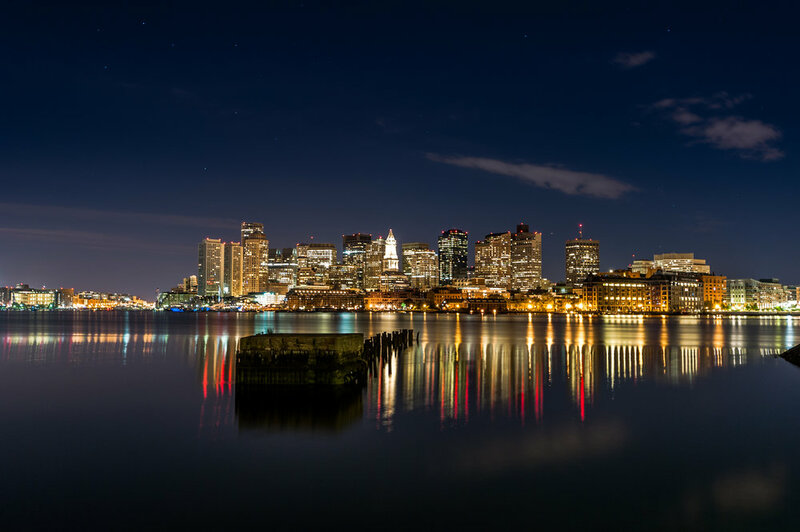 Then my next stop was Boston downtown and there I got a chance to capture Boston downtown cityscape at night. I am writing this blog post to share my experience and ideas on how I captured those shots. First of all, when you want to capture long exposure night shots, you must have to have a sturdy tripod with you. Any shutter speed slower than your lens focal length usually results into blurry image if taken handheld (without using tripod). You may also want to consider wide angle lens as well to capture wide view of cityscape which looks pleasant than only few buildings (using telephoto lens). Let me tell you briefly what camera settings and gears I used to get a crisp and well lit shot. 5. Shutter release cable or Wireless shutter release remote (I use shutter release cable almost every time I use my camera on Tripod. This will help me to reduce vibration on camera while pressing shutter release button on camera. Some photographers use 2 sec delay method (camera takes picture 2 sec after pressing shutter release button) which also works great but I feel that technique bit tedious. When you have all the required gears, all you have to do is pickup the location, compose your shot and snap it. Location is one of the most important constraint to choose right composition. If you miss the right composition because of the location, all your hard work goes into vain. When I take night cityscape shots, I try to include wide range of objects such as bridges, ships, cruise etc to add up variety to the scene. Here I have included three shots along with its camera settings; first one is New York City view from the Empire State Building and the second one is of Boston Downtown. If you have any questions, comments or suggestions, I always welcome them and try to answer it back as soon as possible. Happy Shooting!